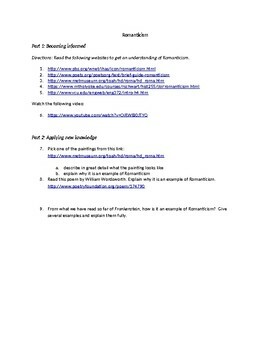 This lesson has students using computers to learn about what Romanticism means and apply what they learn to Mary Shelley's Frankenstein. There are links to websites to read and a video to watch. Then they pick a painting to analyze and explain how it demonstrates Romanticism. Then they apply their knowledge to a poem. Finally, they apply it to the novel of Frankenstein.